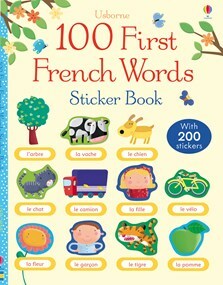 An interactive first word book for young English speakers to learn 100 French words, with over 200 stickers to aid learning. Little children will have fun matching the French word and picture stickers to the pages as they build their French vocabulary. Includes a pronunciation guide to hear all the words at Usborne Quicklinks.